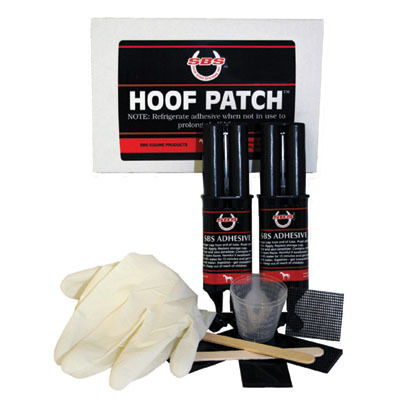 The SBS HOOF PATCH kit contains strong heat moldable resin patches and a two part space age adhesive. Hoof Patch tackles those stubborn cracks in minutes and without screws. It stabilizes the hoof as the crack grows out. Unlike metal patches, Hoof Patch does not need to be removed at the next shoeing. So get Hoof Patch- the twenty minute crack repair kit. It’s easy! Heat mold it. Glue it. Rasp it. Two resin patches & two 1 oz. dispensers of adhesive per kit. This kit is recommended for hoof care professionals because quarter cracks may represent a hoof imbalance problem that they can address. Front cracks and gauges can be repaired with the SBS CRACK FILLER KIT, Item 201, by the horse owner.